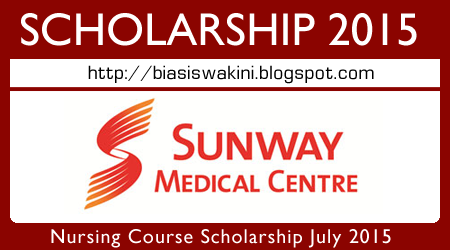 Sunway Medical Centre Scholarship (Nursing Course) July 2015 Intake. Verification and the Standard Malaysia (MS ISO 15189) certification. We are pleased to sponsor qualified students to study a 3-year Diploma in Nursing Course. - Fluent in Bahasa Malaysia and English. - Work at Sunway Medical Centre upon completion of training. e. Photocopy of other relevant school certifications. 0 Komentar untuk "Sunway Medical Centre Scholarship (Nursing Course) July 2015"